Fish oil and vitamin E are each substances that can be obtained through dietary sources or by taking supplements. Fish oil is most known for its high concentrations of omega-3 fatty acids -- healthy fats that can help reduce the risk for heart disease. Vitamin E is a fat-soluble vitamin whose antioxidant properties can protect against cancer and heart disease. Some researchers believe that taking vitamin E alongside fish oil may provide additional benefits. Fish oil supplements are extracted from fish that are naturally high in fats. Among these are mackerel, tuna, herring, salmon and cod. While fish oil is used to treat a number of conditions, MedlinePlus notes that it has proved effective for lowering high triglycerides. Elevated triglyceride levels can lead to heart disease and diabetes. Fish oil contains two particularly important omega-3 fatty acids: eicosapentaenoic acid, or EPA, and docosahexaenoic acid, or DHA. According to a 2007 article published in "Alternative Medicine Review," DHA and EPA can each enhance quality of life by improving mood and cognitive function, as well as lowering the risk of premature death. Vitamin E is an antioxidant vitamin that plays an important role in protecting cells from the damaging effects of free radicals -- rogue molecules that contribute to the development of cancer and cardiovascular disease. Foods rich in vitamin E include nuts, seeds and vegetable oils. The National Institutes of Health Office of Dietary Supplements notes that vitamin E has been shown to prevent low-density lipoprotein, or "bad" cholesterol, from oxidizing -- or becoming electronically unstable through the loss of electrons. This can be crucial in preventing atherosclerosis, a condition characterized by hardening of the arteries, which can lead to heart attack and stroke. According to the Linus Pauling Institute, there may be additional benefits to combining omega-3 fatty acids with an increased intake of vitamin E. This is because vitamin E can play an important role in preventing polyunsaturated fatty acids, such as those in fish oil, from becoming oxidized, or rancid. For this reason, small amounts of vitamin E are often included in fish oil supplements to prevent spoilage. The institute also notes, however, that it is still unclear whether omega-3 fatty acids are easily oxidized inside the body, the way they are outside the body. A study published in 2000 in "Medicine and Science in Sports and Exercise" concluded that vitamin E supplementation, when taken alongside fish oil, was able to reduce oxidative damage in rats.Fish oil may also reduce vitamin E levels in the body, which provides further reason to take the two together. While there may be a benefit to consuming vitamin E supplements alongside fish oil, there are also some potential risks. Because both fish oil and vitamin E can increase the risk of bleeding, individuals on blood thinners, or those who have a high risk of bleeding, should avoid this combination. The Office of Dietary Supplements notes that the recommended daily allowance for vitamin E for individuals 14 and older is 15 milligrams, within a tolerable upper limit of 1,000 milligrams for those 19 and older. 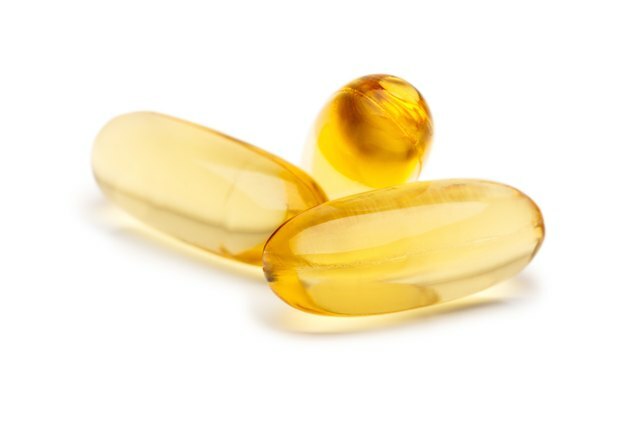 According to MedlinePlus, up to of 3 grams of fish oil per day is likely safe. Doses higher than this, however, may increase the risk of bleeding. Is There Vitamin D in Omega 3?